The western is a niche genre, at least in book form, with limited opportunities for exposure to the public. Few bookshops actually stock them for instance. In the UK, long-established publisher Robert Hale is pretty much the only game in town, publishing several Black Horse Westerns (BHWs) a month in hardback form, the vast majority of which go to public libraries. Like academic books, these are priced highly and built to last. Libraries treat them as a generic commodity, not bothering to shelve them in alpha order. Taking all this into account – no high-street distribution, high prices, many titles produced, publisher with a tiny marketing budget, indifferent distribution network – it is difficult for an individual title to stand out and start notching up retail sales. 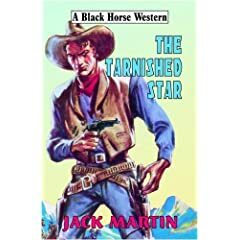 The Tarnished Star, as by Jack Martin is an exception. As I write it is at the top of Amazon’s western chart, having also topped their pre-order list. According to the publisher, ‘More than one thousand copies of Gary’s title were pre-ordered while five other BHWs scheduled for simultaneous June publication were virtually ignored.’ The book has been bought, reviewed, and talked about on both sides of the Atlantic. Why has this happened? I suggest that diligent and creative use of the internet, particularly its social media side, has made the difference. I started the Tainted Archive, thinking it would help me publicise my book and I make no excuse for that – I’m a writer and want people to read my work. An unread book is merely wasted paper. But I didn’t expect it to do so well – I think that I have a level of self belief that is above the average and that comes across when I talk about my work. When Tarnished Star was accepted I had achieved a life long ambition and I got excited and somehow, I’m not sure how, I transferred that excitement into my blog. I’m still excited – don’t forget Arkansas Smith next March. [Note deftly inserted plug! – R.] First and foremost though I work bloody hard on the blog and the books. Some of this ‘bloody hard’ work generates a cluster of communication surrounding the book itself. In effect the ‘product’ of the book is enhanced by an expanding cloud of online messages, including for example this blog post. This creates interest, goodwill, and (pardon the overused term) viral marketing, like word of mouth but with keyboards and pixels instead of mouths. Although this won’t make Gary into the next J.K.Rowling, there are parallels between the mini-phenomenon of The Tarnished Star and the macro-franchise-superstorm of Harry Potter. Marketing thinker John Grant elaborates a ‘brand molecule’ of Harry Potter, which as well as the books and films includes things like the J.K. Rowling ‘rags to riches’ story, stunts like the midnight releases, and the press stories about the Potter books getting kids to read. One could construct a similar molecule around Gary’s book, with things like the Wild West Mondays campaign, Gary’s personal story (he’s an actor who has been in Doctor Who and Larkrise; he drives a cab), his websites, the wider world of westerns and so on. Theorist of online culture Nicholas Negroponte suggested back in 1998 that ‘All things digital get bigger and smaller at the same time…We’ll see a rise in huge corporations, airplanes, hotels and newspaper chains in parallel with growth in mom-and-pop companies, private planes, homespun inns, and newsletters written about interests most of did not even know humans have’. I guess the Tarnished Star marketing story shows how, at the ‘small is beautiful’ end of the spectrum, possibilities exist for individuals and small companies to carve out niches for themselves, if they are skilful in operating in social media world. – communicating what it stands for. Much more importantly, organisations are made up of individuals, each of whom can be empowered to do ‘Dobbsian’ marketing, even if only for self-interested promotion of themselves or their own patch. For instance, my team’s job is marketing our university, and we do what we can. But if a handful of people in departments across the University were willing and able to undertake the kind of vigorous, relentless micromarketing that The Tarnished Star has had – playing all the angles on a daily basis, taking opportunities for guerilla marketing as they occur – we would be doing even better than we are. Perhaps the secret is not so much having theories and policies about social marketing (like the 20-page Twitter policy produced recently by a Government department) as simply having a go, and getting our hands dirty – ‘tarnished marketing’ on the new frontier. The first suit I ever bought, back in 1986 as I prepared for my first suit-wearing job, was from a branch of Burtons. It took me 23 years to buy another one. My repeat purchase came about because I happened to watch an episode of British Style Genius on BBC2, in which there was talk of a new ‘heritage’ range of Burton suits based on old 1960s designs, using English cloth. These sounded like fun, and I looked in the Ormskirk shop a few times hoping to see them – but all they had were the usual young lager-drinkers’ leisure outfits and first-time-offender-court-appearance suits. (No offence intended to anyone who shops there 😉 ) Eventually I cracked and looked on the website, which did indeed have the ‘heritage’ stuff, but only as end-of-lines being sold off for small heritage-style amounts of money, £20 for a jacket and £10 for trousers. I took the risk of buying one, and luckily it fits reasonably well – a least as well as the suit sported by the patriarch of the PG Tips chimp family, in their Wall Street inspired yuppie-themed period in the 80s. It is a nice suit and I can’t imagine why they failed to sell them for the original price. It’s a curious hybrid of new and old, with handy extra iPhone size pockets, and an array of buttons inside the trousers to which braces might be attached, such as would have been familiar to men being demobbed from either World War. Having become a Burton fan, I couldn’t not buy Ideals in Industry: being the impressions of social students and visitors to the Montague Burton workshops (3rd ed, 1936) when I found it in a secondhand bookshop in Halesowen. The book, published by Burton themselves, is a highly self-congratulatory corporate history. This particular volume, number 20068, was presented to one P.B. Jenkins, a salesman at ‘branch 339’, as an ‘efficiency award’ in 1948. He would have read about the triumphs of his company, capitalism at its most benign: the ‘20,000 employees on payroll’ mentioned on the letterhead seem to have enjoyed light and airy canteens, social programmes and support provided by a company that believed ‘that a great business may have a heart as well as a counting house’. I’d be first in line anyway – hoping for a loyalty bonus for buying three things from them in a quarter of a century, and as a downside becoming (even more) one of the people who, in the words of Joe Strummer, ‘wear Burton suits/turning rebellion into money’. As a piece of corporate communication, the Ideals book seems naive and old-fashioned on the surface. But it has a lot of the same ingredients as its modern equivalents, such as Annual Reports: claims to a higher purpose and appeals to ethical and moral values (‘Less than forty years ago the old traditions prevailed and tailoring was a ‘sweated’ industry. Our satisfaction is to have broken with these traditions. The night has passed and the morning has come’); peacock-like showcasing of buildings and facilities; endorsements from third parties (in this case, visting royals and those ‘social students’); heritage (‘founded 1900’); scale of resources (‘£11000,000 CAPITAL’); claims to uniqueness; and an air of optimism in endless progress. Maybe our next publication will remind readers that ‘efficiency may wear a smile and not a frown’.